Cleans with the power of parsley. Great for use on countertops and appliances! 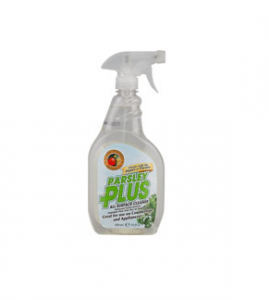 Earth Friendly Products Parsley Plus All Surface Cleaner can be used on countertops, appliances, microwave ovens, floors, ceramic tile and any other surface not harmed by water. Because natural ingredients are used, color and body may vary. Ingredients: Purified water, biodegradable coconut based surfactant, and parsley essence.